This is one my essential habits of work that I think, while decidedly unspectacular, warrants sharing with my fellow woodworkers. When I’m in the shop it’s usually only a short time before I need a small piece of scrap wood for something. It may be for a stop block on my router table fence, a clamp pad, a spacer for clamping stock in the tail vise between dogs, a thin shim to set a door gap, a square block to guide freehand drilling, or for countless other uses. 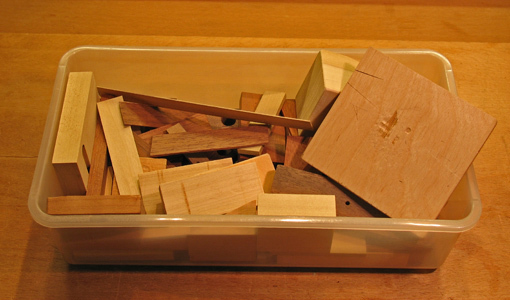 Candidates for the box o’ blocks usually are produced as squared, uniform offcuts from the table saw or bandsaw. That little box almost always seems to have what I need, from a shim that’s, oh, just a bit under 1/32″ to a stout block to hammer against to reset a tool handle. The box contains reminiscences of distantly completed projects such as old tenon cheek cutoffs. I’ve been using this box long enough that I can fondly remember when my then very young daughter and I would play in the shop gluing together little scraps. For her, the main purpose of the box was to save nifty pieces of wood to play with. So the box has served more than one purpose, and, come to think of it, so does the shop. Furniture and memories are built there. I’m pretty sure this tip is not in any woodworking textbook but that box o’ blocks has served well. Its funny that you mention this in the context of memories with your daughter. My 5 year old son regularly raids my “box of blocks” to build random sky scrapers with which he can run his cars into. Beings several of my blocks came from turnings, some resemble cone shaped castle roofs. Thanks for the comment. I hope you and your son share much joy in the shop.